A small fish with a stout body (flattened out wide about the same as it is high) with a head as large as the rest of its tapering body. 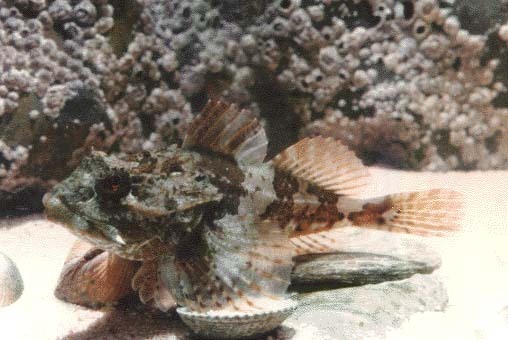 Medium-sized cottid, or sculpin. This family of fish are usually regarded as ugly in appearance with a drab colour and this species has four long spines (two on each side, on the gill cover) that stick out when the fish is removed from the water. Usually in various shades of brown with large cream blotches, in some areas this fish will be orange or red and the cream blotches will be white. The pectoral fins are huge relative to the small squat body. 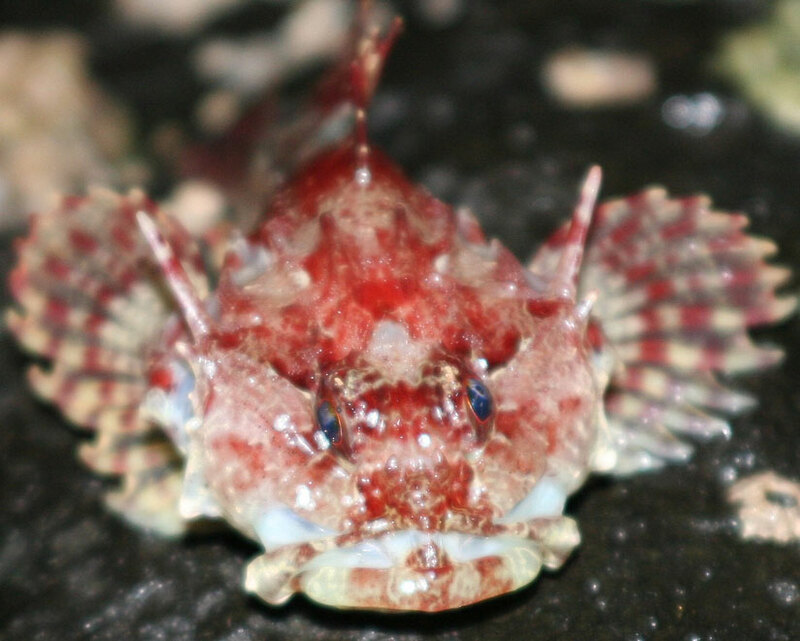 The featured species can also be reddish (picture in Linda Pitkin's book) and then the flaps at the corner of the mouth should be looked for. Similar species: Myoxocephalus scorpius is very similar in appearance. However, the two species can be readily distinguished because only T. bubalis has two white lappets on the corners of its wide mouth. The Norway Bullhead, Taurulus lilljeborgi, is found in deeper water off the coasts of Scotland and Norway. 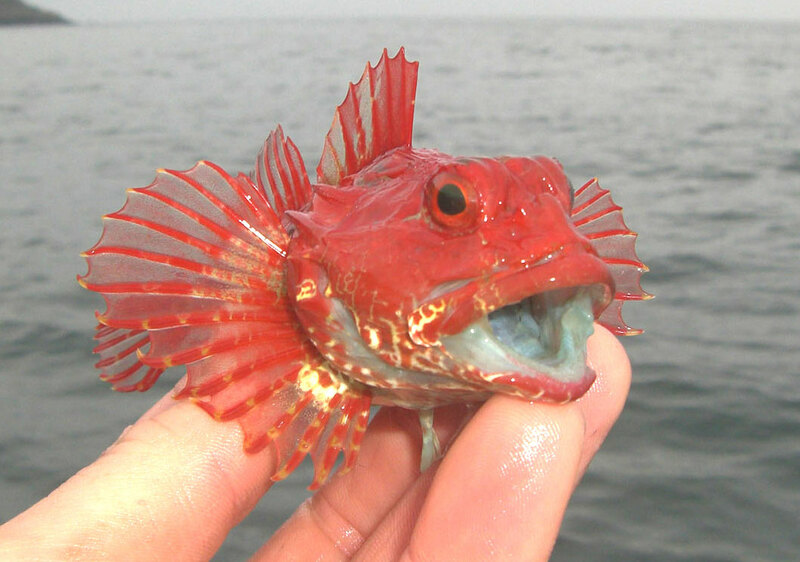 It is usually reddish in colour with similar markings, and the long spines on each gill cover are almost identical. A photograph can be found on the Norwegian web site. Bullhead Taurulus bubalis demonstrating how bright colours can be camouflage (Link). Photographed at Tjärnö Aquarium by Mike Noren. 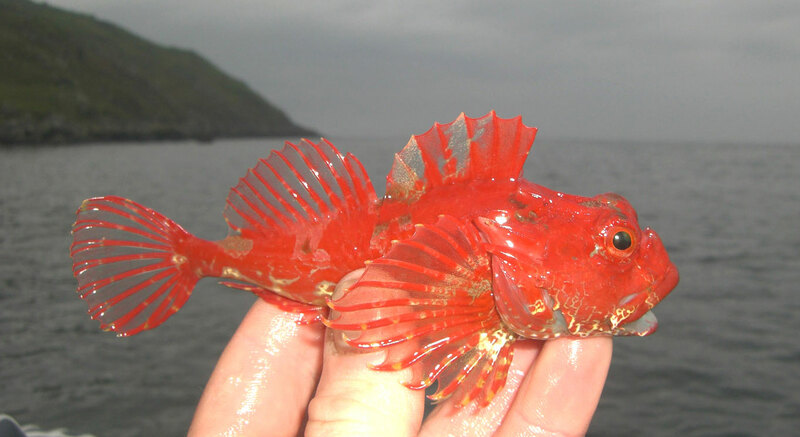 Red specimen from Bangor Pier, County Down, Northern Ireland. There are piles of boulders along the back of the pier as a sea defence with massive gaps in between them. I would normally fish down between these to see what species of fish are about. All sorts turn up . Early spring. 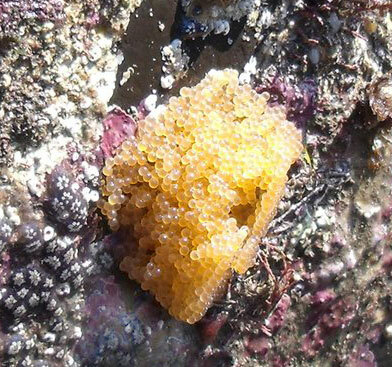 Small clumps of cream caviar-sized eggs laid in shallow water. At a length of approx. 8.2 mm (excluding caudal fin), the dorsal fins of the larvae are clearly separated, the first dorsal with 8 ray supports, the head completely pigmented, the body and fins transparent, and found amongst the weed in a shore pool, (one specimen) at Kingston beach, Shoreham on 13 May 2001. In the wild, Bullheads spawn in Spring, from February to May, at the end of their second year. Breeding should be possible in a large aquarium. Shallow rocky areas. 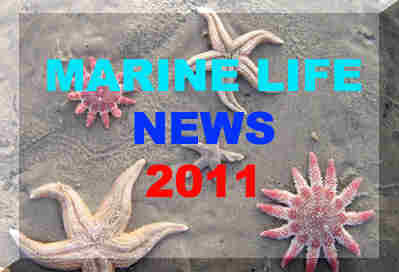 Small fish will be found in tide pools during the summer. M. scorpius lives in deeper water. 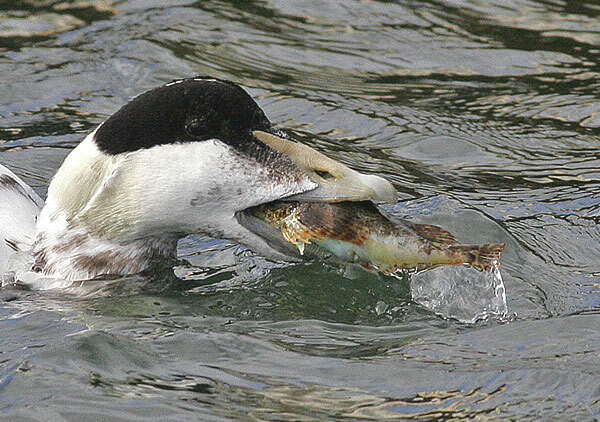 A large expandable mouth will swallow fish as big as itself. Flattened crushing teeth so it cannot eat anything it cannot swallow whole. In the English Channel, palaemonid prawns are its principal diet in the summer. It will readily take worms on a hook and bait meant for much larger fish. Known to eat small gobies, small blennies and small wrasse, but not the Butterfish, Pholis gunnellus. The Butterfish is too slippery for it to grip with its teeth. I saw the large bullhead eating a smaller one, head first, the large fish was on the resting (?) on the bottom, with the smaller one's tail, sticking out. I did not see the attack. There were four bullheads in the tank when I saw it first. Ten days later there were two, and one was being eaten! All rocky coasts around the British Isles. Its range in Scotland is not known and may be replaced by M. scorpius. Norwegian coast. English Channel, North Sea, Irish Sea. Larger fish, sea birds, Otters. 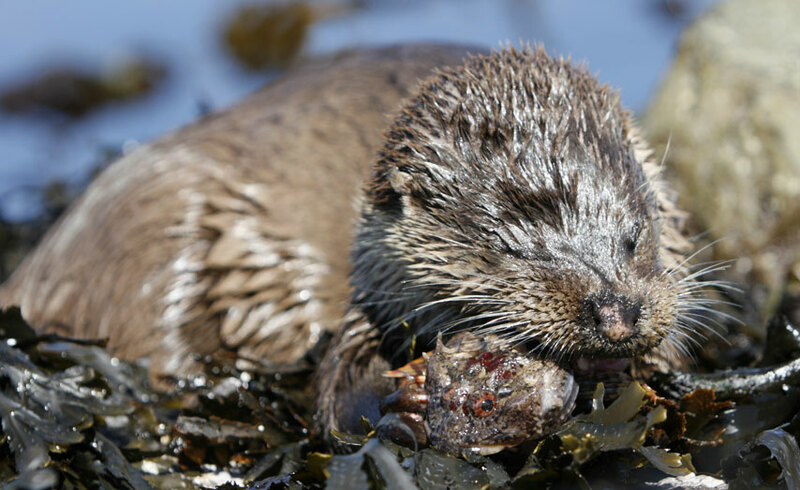 Otter eating a Bullhead, on the Isle of Mull. so this is a most extraordinary photograph. Isopods, family Gnathiidae (gnathids). Species: Gnathia sp. The young of these isopods are called pranizae. The parasite on Sue Daley's Taurulus bubalis is a male Anilocra frontalis (a cymothoid isopod.) These isopods are common on Black Sea Bream in Guernsey waters during the winter months. I have recorded them also on wrasse, Poor Cod and Red Mullet. I have been surveying a small rocky bay, La Valette, near my home in Guernsey. I have visited it at least 20 times since March when I was introduced to the bay by a group of Nottingham University students. I found also a small Long-spined Sea Scorpion, Taurulus bubalis, (TL 61 mm) at the midshore level in a gully. I placed it in a tray for photography. As I did this I noticed 5 or 6 blue-green bodied creatures dashing around in the water. These turned out to be juvenile gnathids. They are pranizae. They are bright blue-green and well camouflaged on the sea scorpion. I have developed my photos of the sea scorpion and I can clearly see the pranizae on the pectoral fins and body of the fish. The book name of Sea Scorpion may be used by divers. 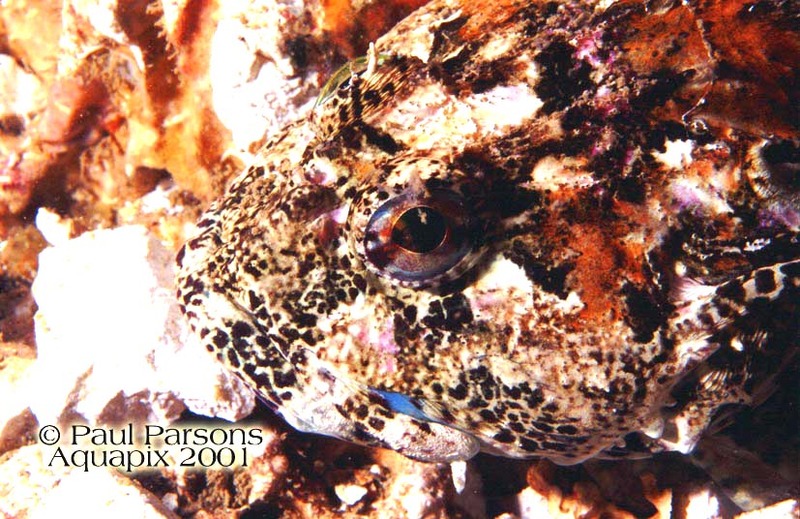 The common name Longhorn Sculpin (USA) is sometimes used for the western Atlantic species Myoxocephalus octodecemspinosus so this name has been deleted from the list of common names. Growth: one female in captivity grew to a length of 14 cm (excluding the tail fin) by the second summer. In this specimen the width of the mouth opening was 35 mm (exterior of the mouth was 40 mm, excluding the 2 lappets which are unclear out of the water), the diameter of the eyes 8 mm, the length of the longest slightly curved spine was 17 mm. The width of this fish at the widest point was 58 mm (i.e. it was 2.4 times longer than it was wide at the position of the gills). Growth is usually less and males may even grow to less than 8 cm in length by the second summer. Andy Horton from captive study. Large fish have high oxygen requirements and are intolerant of temperatures over 22°C. However, the first year juvenile fish (that are common in rock pools) are able to tolerate temperatures up to 26°C in the short term (aquarium study). Large numbers of juvenile fish (first year) have been found on occasions with hollowed bellies as though they had insufficient food in silty conditions (River Adur estuary). Largish specimens, 10 cm, intertidally on the Scarborough coast (March 2000). Bullheads caught regularly off Roker pier, Sunderland (NE England), 125 - 200 mm. A reddish-brown, but predominantly red, specimen of what was almost certainly this fish was captured in a prawn net by Dean Tucker (Solihull) on at Challabrough beach south Devon on the 30th July 2000. This is the next beach along from Bigbury Bay. A small Bullhead with a rust-like tinge over its body was collected from Kingston beach, Shoreham, in October 2000, for its photograph. However, within one week this rust-like tinge had disappeared. AH. 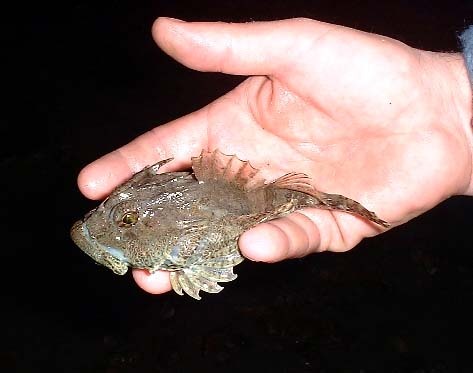 Several hundred Long-spined Bullheads were found up washed on the strandline on Lancing beach at the western end of Widewater Lagoon, West Sussex. This has has not been recorded before. We found a Long-spined Bullhead in a rockpool on Porthmeor Beach in St. Ives in Cornwall on the 10 August 2001. The fish was found by Emma and Joe Yapp and was about 15 cm long. It was identified by its big head and 2 white lappets on the corners of its mouth. Four Bullheads, Taurulus bubalis, found on Caswell Bay (all in one pool), Gower, South Wales - 1st of September 2001. Identified by shape, coloration and lappets by Adam Cooper (Swansea). We are fairly new to sea angling and this thing came as a bit of a surprise - it looked so ugly that we though it must be dangerous so I was given the task of unhooking it : After being gently wrapped in a moist tea-towel (I didn't like the look of the spiny fins) and unhooked it was returned successfully and swam off looking none the worse for it's adventure. Date/Time: Saturday 29th Sept, 2001. About 4.30pm. Location: We were fishing on the pier at Blythe, about 20 yds past the dogleg (the pier turns a corner on its way out to sea). Tackle (just in case you are interested): A float setup was fished in amongst the pilings of the pier. Bait was fished at a depth of around 6 feet (I don't know exactly how deep the water was but assume this was fairly near the bottom). A number 1/0 sized hook was used. Bait: A smallish ragworm was threaded up the shank of the hook, which was tipped off with a chunk of frozen mackerel. The fish had fully engulfed the mackerel. like any pics I can find of those. skin. Certainly it was not as light in colour as the picture shown. interested to know about bullheads. 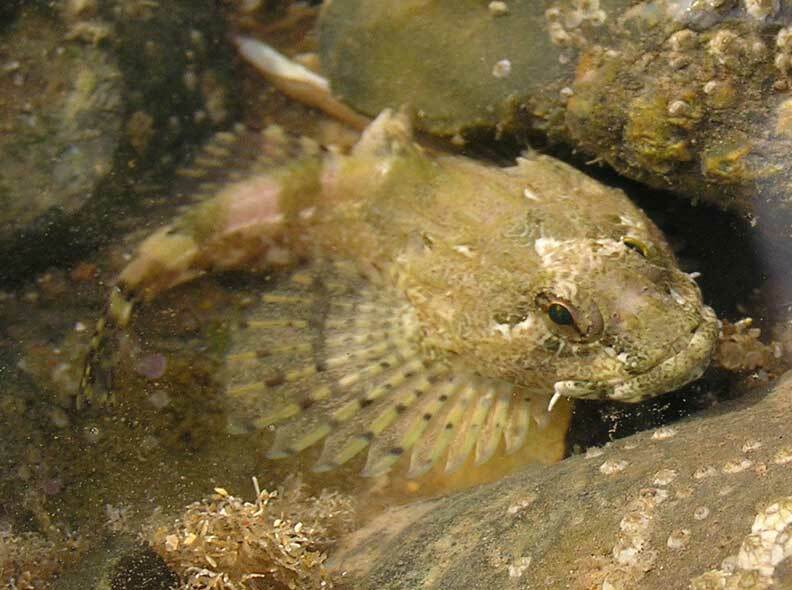 D.Allen found a Long-spined Bullhead on Swanpool Beach, Cornwall. 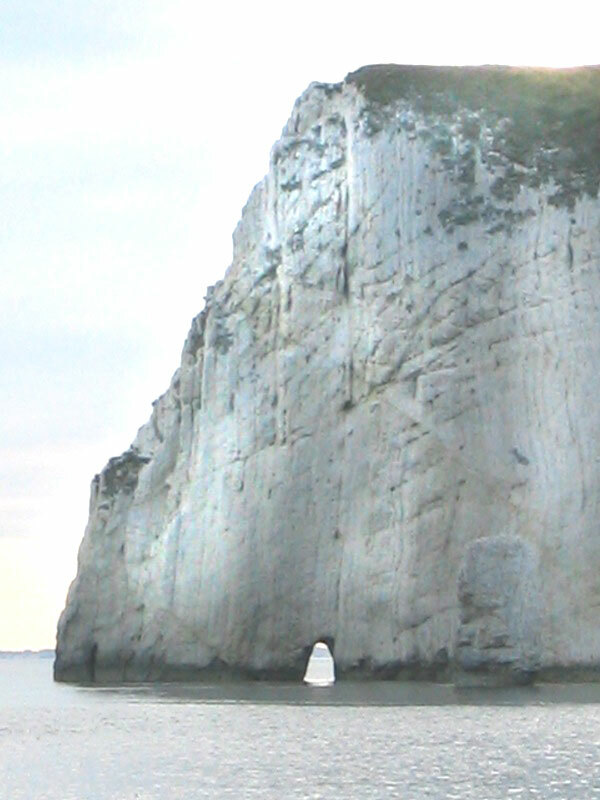 A Sea Scorpion (Bullhead), shown in the photograph above, with strong colours and patches of white, on the undersea chalk cliff face known as the Worthing Lumps, about 3 miles off the Sussex coast. I fished with some friends Saturday night on Llandudno pier, north Wales, we were getting knocks but failing to connect, we were fishing the bay side of the pier where it broadens out at the end, casting into an area illuminated by a floodlight, the tide runs at an angle from shore directly under the wing of the pier, and is quite fast and strong. My friend Geoff pulled in a fish, which yes frightened the life out of us, and we have been trying to identify it which is why I was looking at this sight. The fish we caught, he went on to catch a second one an hour later! fits the general description of the Bullhead but does vary in coloration and I question size. Here goes, without the histrionics, first impression was of the mechanical fish from stingray!, sorry but it was night time and the thing was bloody ugly, but its coloration was fantastic, which led us to be convinced it was poisonous! compared to the head and was iridescent white with brown spots, the spots where distinctive and had a lighter aura effect at outer edges. Both fish showed the same blue tinges, some quite dark but merging into the whiteness of the body, i.e. fading, this was mainly from below the fish spreading down the body to the tail, these seemed irregular, i.e. not the same on both fish. There may have been secondary spines/rays slightly behind the large pectorals, i.e. like damaged fins. The fish both took mackerel and squid cocktail baits, on size 1/0 hooks. Both fish were unhooked by myself, I found the best technique was to lightly grip the upper mouth with pliers and remove the hook with surgical forceps, sounds horrendous but we wanted to avoid the spines and wrapping the fish to avoid these would have resulted in removing any mucous and possible damaging the skin. The fish seemed to prefer this method which was quick, the upper mouth appeared very strong in terms of bone construction so grip was easy and did not require a lot of pressure. both fish were immediately released and swam away strongly. What were they? as i say they did not match the coloration of the Bullhead, and were big, can you help. A Middlesborough angler told us they were Scorpionfish, no one else including local anglers had never encountered anything like them before. Pillar box red Bullhead caught on a ragworm bait from Roker Pier, Sunderland by Mark Scott. It was about 15 cm long (including the large caudal fin). 21:00. HT 22:00. Approx size 15 cm (6 inches). Colour: pinkish red with cream. I caught a Bullhead off the beach at Llanrhystud, 9 miles south of Aberystwyth, Wales (Cardigan Bay) using Mackerel bait. I wasn't sure what it was as I've never seen one before several other fishermen who were there couldn't decide wether it was a Bullhead or a Weever fish I looked it up when I got home and it was the Bullhead. 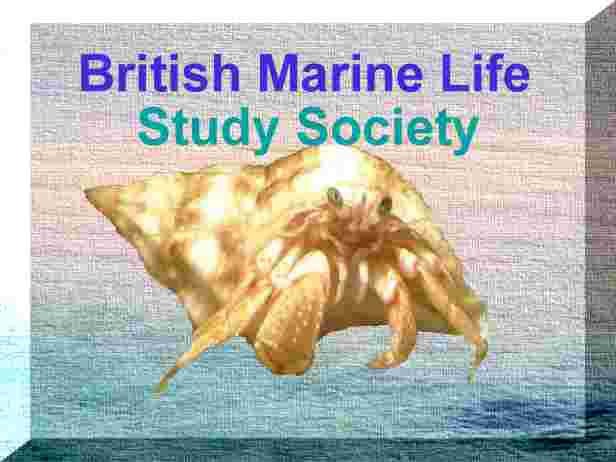 My book calls it a Sea Scorpion. We visited West Runton coast and saw these two fish they were about 4 inches long and in the rock pools, and we have been looking on the net to find out what they were. This is when we came across your site and wonder if they are Cottidae or the T. bubalis . This study shows how effective the camouflage of this fish in pools on the shore and in the shallow water. This attractive red Long-spined Bullhead latched on to the bait on my friend's fishing line (without swallowing the hook) and was returned alive to the sea off the east coast of Northern Ireland (just north of Tornamoney Point, which is just north of the village of Cushendun in NE County Antrim). The white lappets in the corner of the mouth cannot be seen clearly in this fish.